Egypt´s “Crook & Flail” staffs were often depicted in the hands of the Pharaohs. 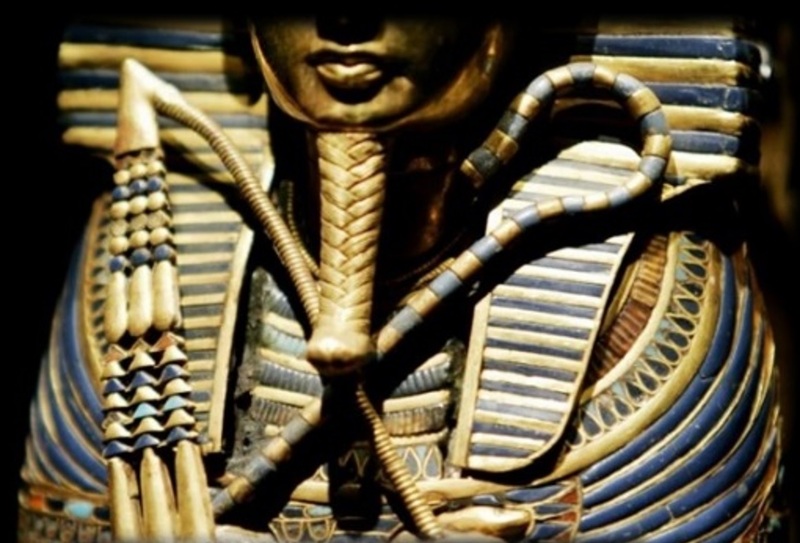 These instruments are described by Egyptologists as “symbols of kingship and royal authority.” But this vague and unclear definition ignores the occult view that the Crook & Flail served a much more important purpose—a purpose specifically related to the “Great Work” of spiritual transformation. 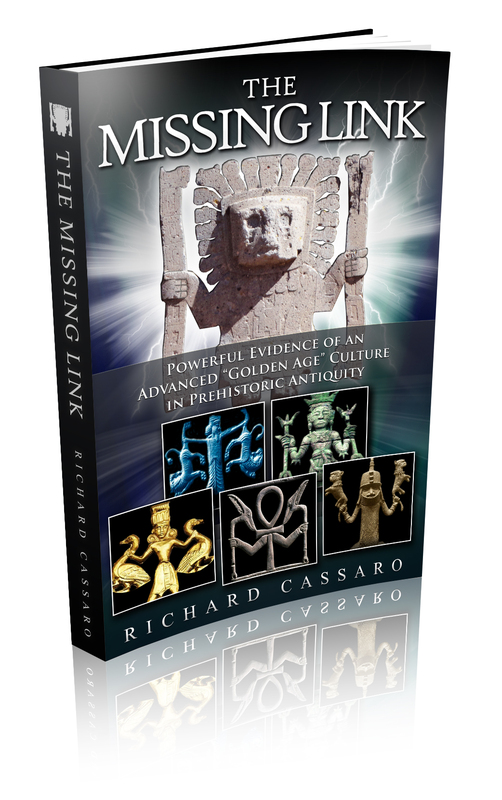 We´ll take a closer look at the Crook & Flail staffs and reveal their true esoteric meaning as tools a spiritual seeker can use to transform his/her lower (animal) self into a servant of his higher (spiritual) Self. The Crook & Flail staffs, here depicted on the coffin of King Tutankhamun, are called “symbols of divine authority” by Egyptologists. A longstanding esoteric tradition teaches that the ancient Egyptians were in possession of an advanced metaphysical doctrine. This doctrine was based on the idea that humans possess two intertwined natures—a human “animal” self and a divine “spiritual” Self. Egypt´s metaphysical doctrine taught that humans should not identify primarily with their “physical” animal lower self. Instead, we should focus on rediscovering our “spiritual” divine higher Self, which is who we really are. 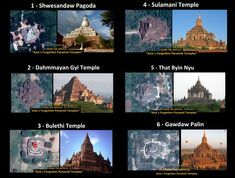 The difference between the lower self and higher Self is described in Buddhism’s Tathagatagarbha Sutra (c. 3rd century AD), which teaches that we all have a “Buddha within” (tathagata), a “perfect soul” or “divine spark.” However, our Buddha nature is covered by layers of vestures (garbha) in the form of bodily passion, anguish, greed, anger, ambition, lust, confusion, and so on. 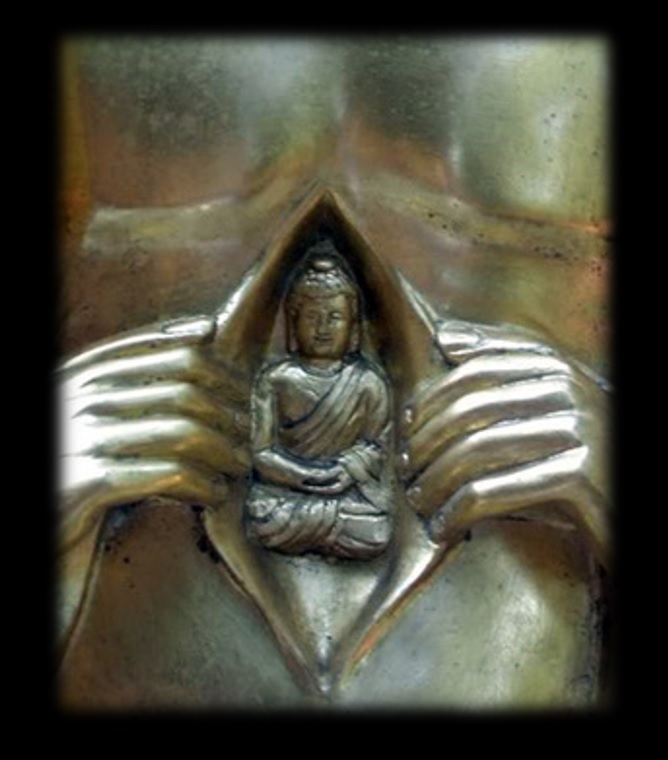 Life’s goal is not only to rediscover this Buddha inside, but also to remove the outer layers of clothing that bury him. The ancient Egyptians were so focused on “becoming an Osiris” in life that when they died they buried themselves in his image. Indeed, Egyptologists tell us that the entire funerary ritual of the Egyptians was designed to transform the deceased into an Osiris to show they lived as he did. 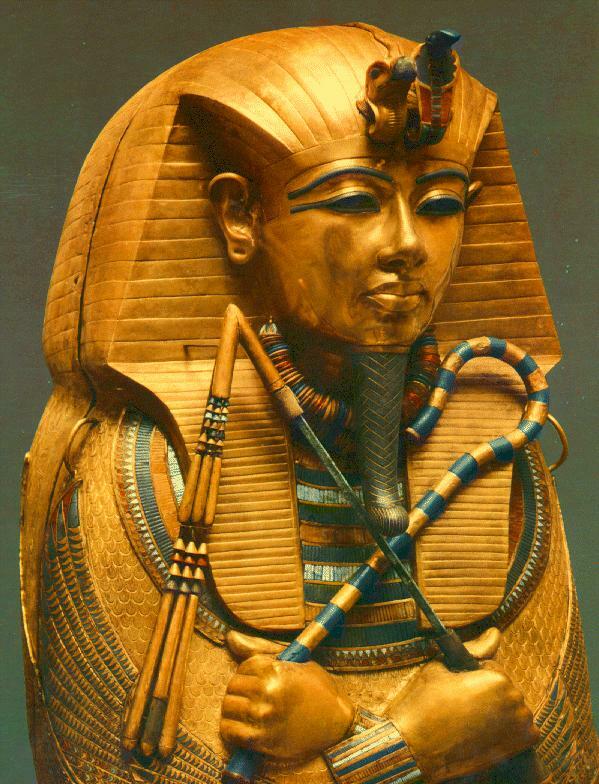 But how exactly did the Egyptians transform their dead into the god Osiris? The name Asar” (Osiris) in Egyptian hieroglyphs features the image of a bearded man with long hair. 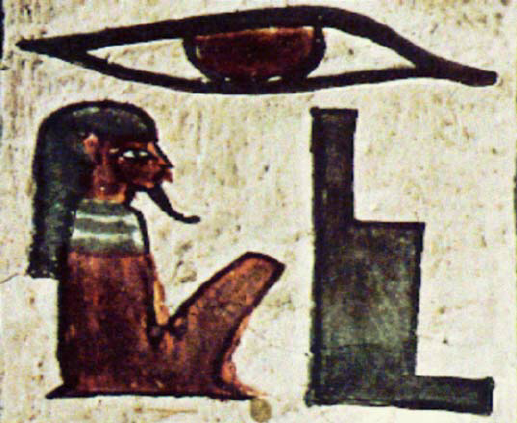 In Written in Stone I theorized that this image of a bearded man with long hair is an image of how Osiris looked. More precisely, this image—which signifies the word “god” or “godhood” in the Egyptian system of hieroglyphics—symbolized the “godhood” or “god nature” or “higher Self nature” that vivifies and animates every human being. 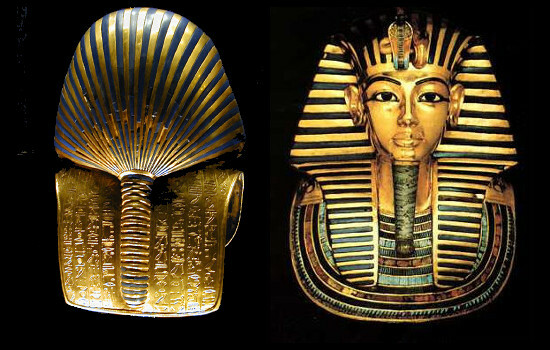 I also theorized that the two main funerary items placed on the deceased—the “nemes headdress” placed on the head and the “plaited beard” placed on the chin—were props used to transform the outward appearance of the deceased into an image of this “god nature” that exists within each of us, which the Egyptians called Osiris. The headdress is a depiction of long hair; the headdress was tied into a ponytail at the back of the head, as is often done with long hair. The braided goatee is clearly a beard. Look closely at the image below: Can you recognize the long hair and beard? The dead were dressed in the image of Osiris, a bearded man with long hair. The “headdress” is a depiction of long hair; the headdress was tied into a ponytail at the back of the head, as is often done with long hair. In my book, “Written in Stone,” I theorize that the Egyptians were buried in the image of Osiris—a bearded man with long hair—so they could follow his resurrection. 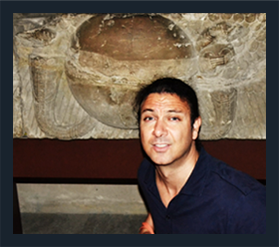 By going to their graves in Osirian form, the Egyptians were showing that they had found their higher Self within—what we would today call their “Buddha consciousness” or “Christ consciousness” within. Osiris had “mastered” his lower animal self. You might say that his higher Self, or the “god” part of himself, was able to overpower or “master” the lower animal part. But such mastery does not come easily. One needs tremendous discipline to be able to control one´s emotions, feelings, aggressions, appetites, desires, etc. How exactly does one succeed in doing this? Enter the Crook & Flail, two instruments directly related to the “Great Work” of spiritual transformation and, more specifically, with “mastery” of the lower animal self. The Crook & Flail staffs were tools every Egyptian seeker used to transform his/her lower (animal) self into a servant of his higher (spiritual) Self. The Crook & Flail are shepherd’s instruments—an epithet of Osiris was “Good Shepherd” (i.e., shepherd of one´s lower nature). 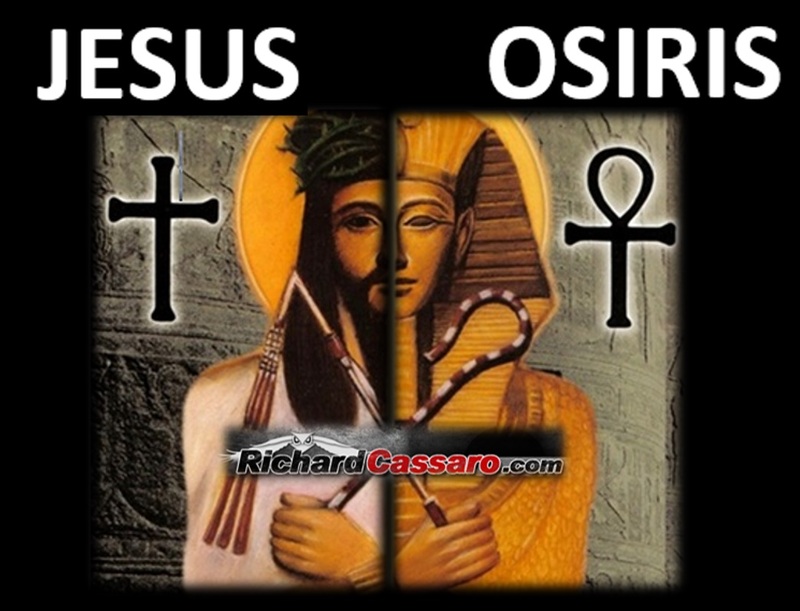 Left: Images of Osiris holding the Crook & Flail. Right: The “Osirianised” dead holding the Crook & Flail. 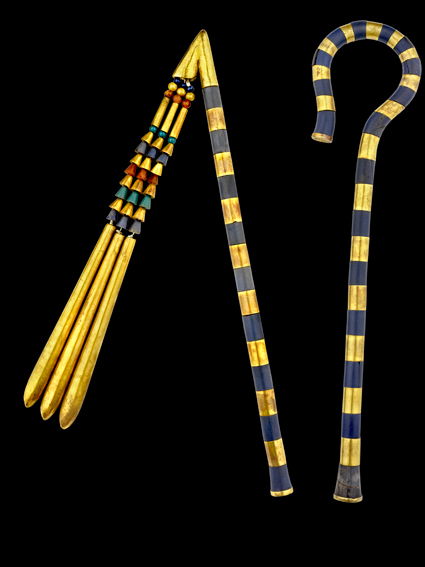 The crook was a cane with a hooked handle, sometimes gold-plated and reinforced with blue copper bands. The crook was used by shepherds; the hook of the crook served to hold a runaway sheep. The crook symbolized the concept of rule, and it serves as the hieroglyph for the Egyptian word “rule, ruler.” However, rather than “ruling” over others, the crook seems to have also conveyed the idea of ruling one´s “lower self” by gently guiding one´s own behavior upward. This is how one becomes an Osiris. In the other hand was the flail or shepherd’s “whip,” a rod with three attached beaded strands. The flail was a simple agricultural tool used for threshing or beating grain from the ear by hand and it was also a weapon. Yet here it doesn´t seem to have been an “outward” weapon used on others, but rather a weapon one might use on their own lower nature to aggressively whip one´s lower self into line. 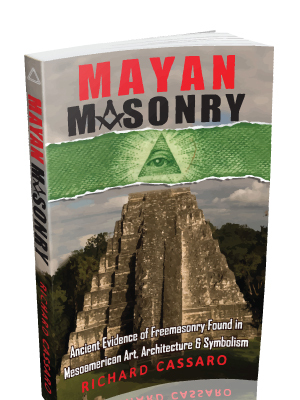 Occultists will quickly note that the two opposing and yet complementary concepts described here—Mercy (Crook) and Severity (Flail)—play a key role across various occult schools. Mercy is conveyed by the Crook, as the Crook is a merciful way to gently “guide” a straying animal back to the fold. Severity is conveyed by the Flail, as the Flail is a severe way to “reprimand” a rebellious animal and force that animal back into line. In this way these two tools help to “mercifully” and “severely” guide the lower animal that is you—your lower animal self. The “crossing” of the two staffs above the chest has various meanings and connotations, but the one most pertinent for our discussion is the act of “combining” their power together (the two instruments are held in the right and left hands in a parallel manner) showing they have equal strength. 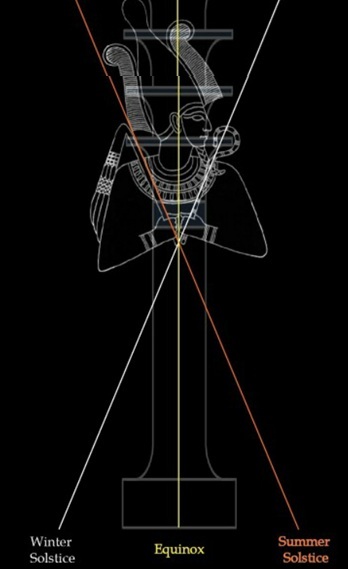 The Osirianised dead, by crossing these two symbolic staffs over his or her chest, were conveying the idea that he / she had used both tools to help them become the Master of his / her own self—to help them become an Osiris. By using these twin instruments of self-control to subdue their lower animal nature, the deceased had “followed in the footsteps” of Osiris (the Egyptian Buddha or Christ) and found their higher Self. “What has not yet been acknowledged, is that again, the crook and the flail are ‘Duality’ symbols, symbolising the opposite, positive and negative, male and female, yang and yin energies and forces. The flail is held by the right hand connected to the male-related left brain, and the crook is held by the left hand connected to the female-related right brain. Now the reason why they were seen as symbols of power and kingship was because being held in this way, the point where the crook and flail were brought together, and the point where the crook and flail crossed over each other at the heart or centre of the body, symbolised the ‘neutral point’ of balance, a condition that can lead to the rebirth associated with enlightenment and resurrection, and one’s vertical alignment with the ‘heavenly kingdom’ . . . the Godhead . . . the source-centre of creation. The Tree of Life is a design that can be described as showing the act of “Creation” as it flows downward from the spiritual to material plane in increasing sephiroth or “emanations.” On the way downward, the sephiroth ultimately form a structure reminiscent of the Fall of Man, or, better the Fallen Man. The bodily physical part of this Fallen Man is marked by twin Pillars—the Pillar of Severity on one side and the Pillar of Mercy on the other side. The spiritual side of this Fallen Man is marked by the center Pillar, which is often called the Pillar of the Soul. 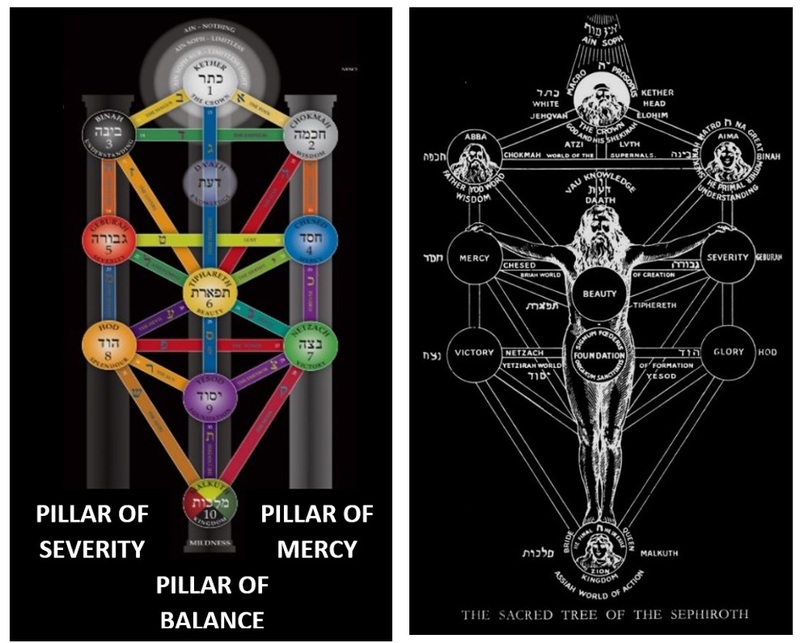 Viewed in its entirety, the Tree of life is actually an image of you—the spiritual eternal you (Middle Pillar) inside your body’s duality (Twin outer Pillars). 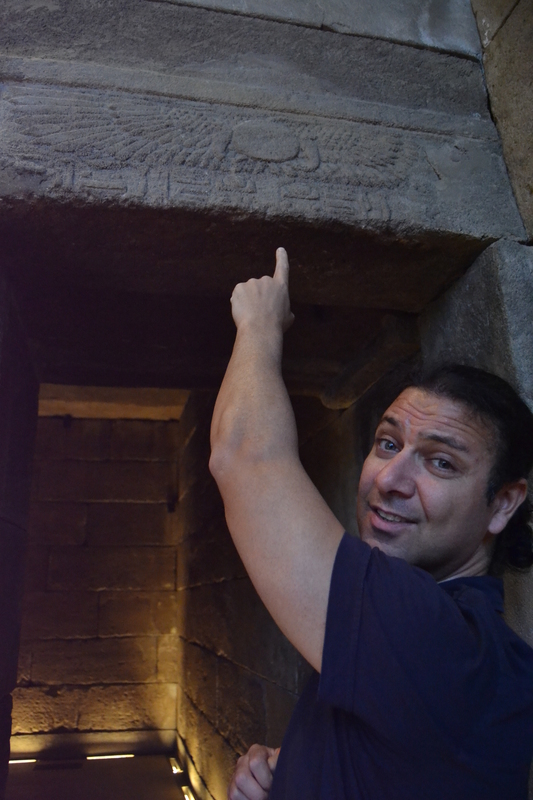 Life’s goal is to rediscover this center pillar—the Osiris nature (i.e., Buddha nature, Christ nature) within you. Once you do that, you´ve found your higher Self. Visualize yourself for a moment stepping into and becoming the tree. The Pillar of Mercy corresponds to your body’s right side, and the Pillar of Severity to your left side. These two pillars are symmetrical, like your body. As mentioned above, Mercy and Severity are opposites. The eternal you, however, is the Middle Pillar, known as the Pillar of the Soul and the Pillar of Balance. Egypt´s metaphysical doctrine—which was not confined to Egypt, and which I´ve described in my books, articles and lectures as the “Universal Religion of Antiquity,” as it was shared worldwide among the world´s first cultures—was inherited by Western occultists, Hermeticists, alchemists and philosophers during the past two thousand years since the decline of dynastic Egypt. 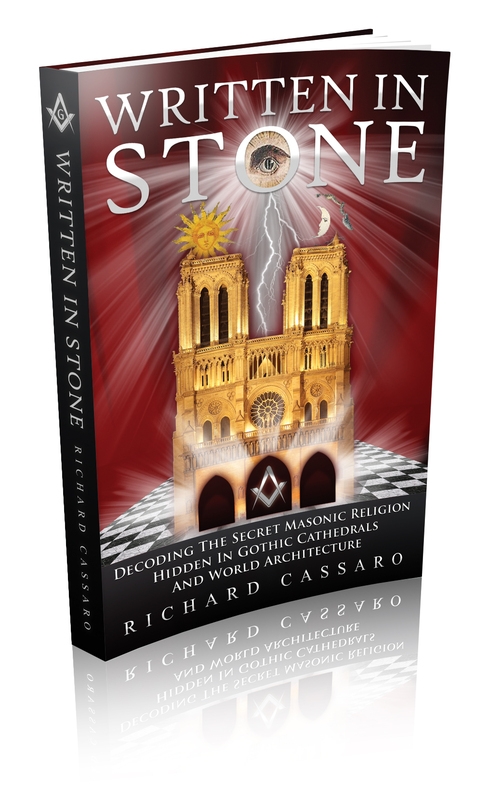 It branched out over the course of centuries and it became grouped into different subgenres called by different names, including the Perennial Philosophy, Sacred Science, Alchemy, Hermeticism, and so on. However, its basic teachings on the fundamental physical/spiritual dichotomy of man have always remained the same.